There has been some Oscar buzz around the grapevine involving Matthew McConaughey‘s performance in Mud. I think that he did a superb job in his role, but I don’t think that the role itself is Oscar worthy. They might just nominate him to give him a little bit of well-deserved recognition, but he won’t win. 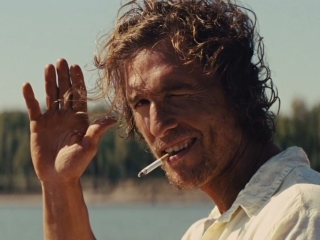 McConaughey has always been a very likable actor. He carries himself well and always brings a lot of energy to his characters. He is usually in excellent shape and the ladies love him. I think that is why he has made so many “chick flicks.” Because of his many romantic movies, I think that a lot of people, including the Academy don’t take him seriously as an actor. I believe that is why he gets overlooked when it comes time to give out awards. It’s a shame because the guy certainly is capable of an Oscar worthy performance, just look at The Lincoln Lawyer (2011), Two for the Money (2005), and Frailty (2001), to name a few. 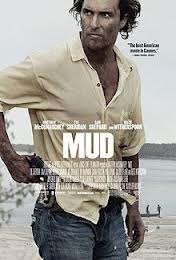 In Mud, Matthew McConaughey plays a man named Mud. He is an outlaw living like a bum on an island in Arkansas. Two teenage boys (Tye Sheridan and Jacob Lofland) get more than they bargained for when they meet Mud after they find a boat high up in the trees on the same island. 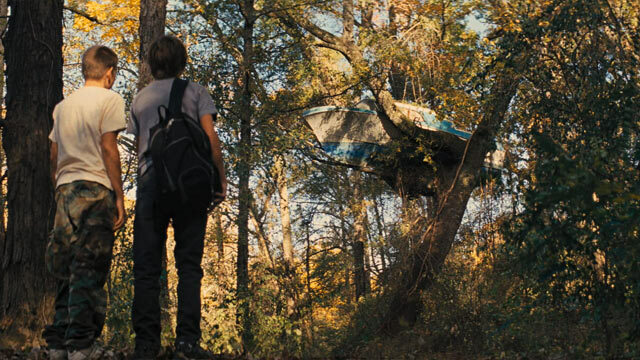 The film was written and directed by Jeff Nichols. The rest of the noteworthy cast includes Reese Witherspoon, Sarah Paulson, Ray McKinnon, Sam Shepard, Michael Shannon, Paul Sparks, and Joe Don Baker. Mud was not exactly what I expected. I guess I didn’t know quite what to expect. The film was unique. The story was original which these days is a little rare. It was a nice change of pace to see a one-of-a-kind movie instead of a sequel or a remake of another movie. Being basically unknown actors, I thought that Sheridan and Lofland both did an exceptional job of carrying their part of the movie. Shepard and Shannon were both fun additions to the film. I’m not a huge fan of Witherspoon, but I felt that she did an okay job in the film. However, I think that her character needed more screen time. That isn’t her fault. The movie could have been improved upon if her part of the story was better told. It just felt like her part was lacking something. I left the theatre thinking that the movie was really good, but something was missing. Her character could have provided that something. The film did a fine job of developing most of its characters and building suspense. It was intriguing. It kept you wanting to know what was going to happen next and was not very predictable. Unfortunately the movie is in limited release. It is a little bit surprising to me that the film is not in wide release. It is the first movie that I have seen in a long time that I could not sit in the part of the theatre that I wanted. I had my choice between the second or first rows. That is how packed the theatre was. Mud is worth checking out if you are sick of the same old sequels or remakes that Hollywood keeps regurgitating for your enjoyment week after week. It’s a nice change of pace to be able to watch a movie that allows the actors to act and counts on their ability and the storyline alone to be entertaining and successful. I rate this movie a 8 on a scale of 1-10. Note: After watching this movie a second time, I had to raise my initial rating from a 7.5 to an 8. The film is better than I originally gave it credit for. Posted on May 29, 2013, in Drama Movie Reviews and tagged Frailty (2001), Jacob Lofland, Jeff Nichols, Joe Don Baker, Matthew McConaughey, Michael Shannon, movie, Mud (2012), Paul Sparks, Ray McKinnon, Reese Witherspoon, Sam Shepard, Sarah Paulson, The Lincoln Lawyer (2012), Two for the Money (2005), Tye Sheridan. Bookmark the permalink. 5 Comments. I didn’t mean for it to come off like I didn’t enjoy it. I did like the movie. I just also felt like it was missing something. It was worth seeing. It’s kind of hard to talk about without spoiling the movie. Yeah, it’s hard! I still want to see it….